Perhaps the most appropriate single word to describe the battle of Verdun is “Death.” Historians for the last one-hundred years have argued over the magnitude of the casualties at Verdun, agreeing only that they were so high as to be beyond human comprehension. The major title of this work, also reflects death and comes from the recollections of a French Army second lieutenant at the battle. The officer served in a colonial infantry unit, and buried a comrade that had been killed in one of the many Germany artillery barrages. The following day, he passed by the grave when enemy artillery began firing again. One round struck in the vicinity of the grave, causing the corpse to not only be flung upward out of the ground, but also to be cut in two by the process. As the lieutenant would have discovered digging the grave, even the soil at Verdun had a certain morbid quality to it. Heavy clay, it was bone-hard when dry, was a mucky morass with any amount of precipitation. German soldiers called that situation Verdunschlamm, “Verdun Mud.” And slinking at that mud, lying concealed, were often razor-sharp shards of artillery shrapnel – ready to slice through leather boots to “bite” the feet of the infantrymen, in much the same way as a motionless poisonous snake preparing to strike. One veteran described the treeless landscape as one large gray sea. In such a featureless surrounding, soldiers sometimes did not bury some of the dead if there was something unusual about the body, its uniform or its position, preferring instead to use the unburied corpse as a navigational waypoint. 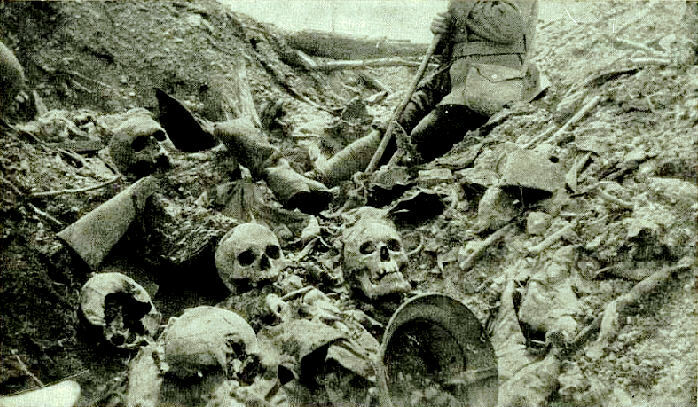 Bodies and body parts simply lay scattered around the battlefield, often for months; remains are still found there one-hundred years after the battle. In 2003, German Foreign Minister Joschka Fischer lumped Verdun in with Stalingrad and Auschwitz as the three most terrible loci in German history. A German non-commissioned officer, who had fought at the battle, put it far more eloquently. The project began in April 2016; I hope to have the book completed in two years in much the same format as the published work on the German Sixth Army at Stalingrad. The Verdun set will be either two or three volumes and will cover the German Fifth Army at Verdun, especially during the period February 21 to September 9, 1916 in a comprehensive manner.